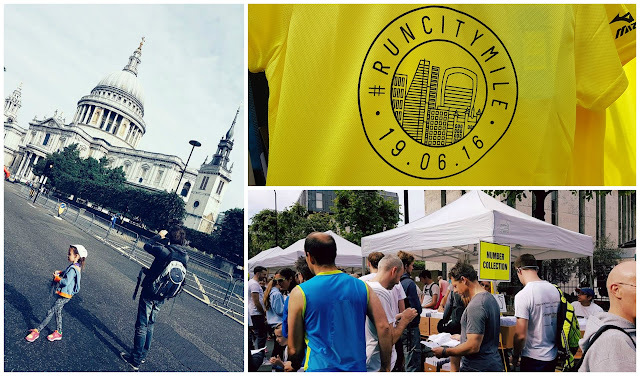 The City of London Mile is a free, 1 mile race that takes place on closed roads in the area around St, Paul's Cathedral. 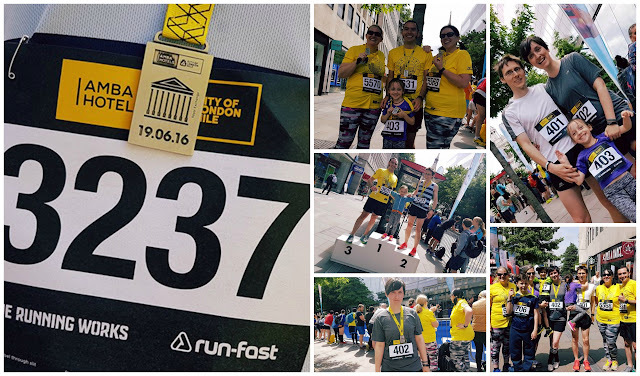 2016 marked the third year the race was held and it was the first time we had taken part. I signed myself and the family up online and as I mentioned earlier, the race is free. On the day of the race we travelled up to Central London by train and alighted at Cannon Street Station which is just a short walk away from the race village, which was on the road which runs along the eastern border of St. Paul's Cathedral, New Change. Upon arrival I changed into my running gear and as the course was 100% tarmac I went for my New Balance Zante V2 shoes. Number collection was available in the week leading up to the event from Run-Fast (The Running Works) in the City of London. However, I couldn't make it over there so we just collected our numbers on-the-day from the collection point. I actually had to pick up two numbers for myself because I had entered two waves; a race wave so that I could have a good tear-up and also the family mile where I could run with my wife and daughter. We met up with some friends from Dartford parkrun and found a nice base to hang out near the finish. As each of our waves came around a few of us would head off while the others watched the bags and cheered. Incidentally there was also a bag drop facility, but we didn't use it. The queue to collect bags was pretty long later in the morning so I was quite pleased that we had had an alternative in place. The first of our waves to head off was the wave that me and my friend Adam were assigned, which was wave 3. I have to admit being a little confused by the system that was in place at first. Runners in a wave were called to a waiting area in the race village and then moved around to a second waiting area before finally being allowed into the start pen, which was on the road to the south of the cathedral called St. Paul's Churchyard right at the point where it changes into Cannon Street. What didn't help was that the guy calling the runners only had a very small portable megaphone thingy and we didn't hear it until he was calling wave 4. Anyway, we figured things out and ended up in the start pen with the rest of wave 3. There were 314 people in wave 3 which made the start area felt pretty tight and when the starting pistol was fired it took a few seconds to reach the timing mats. The course, which was slightly different from the route published on the official web page, took the runners from St Paul's along Cannon Street where the course bore left onto Queen Victoria Street and past Bank Station. The next part consisted of an anti-clockwise loop of the Bank of England along Threadneedle Street, Bartholomew Street which was ever-so-slightly downhill, then onto Lothbury. This was the halfway point of the course. The loop continued with a left-hand turn onto Princes Street where the loop of the Bank was complete. The route then headed through Poultry and onto Cheapside for the last 400 metres. Cheapside is on an extremely gentle incline as it leads back towards St Paul's Cathedral. The finish line is located just before the junction at the north end of New Change where the runners collect their medal and are fed directly back into the race village. About an hour later, and just after some of our other friends had set off, I was back on the start line for family wave 1 with my wife and daughter. This time around was a more relaxed and a lot of fun, but still very busy. There was plenty of support and my daughter really loved it. 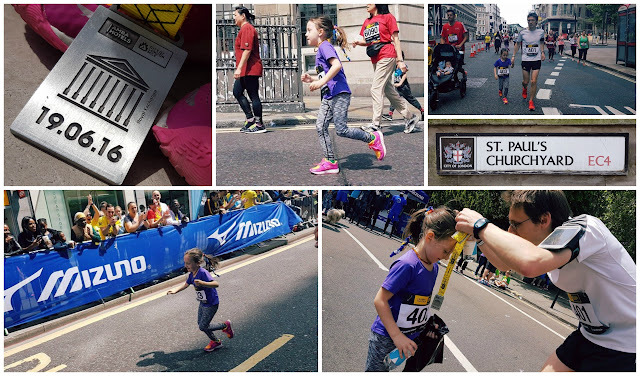 However her favourite bit was right near the end where she got some huge cheers from our friends near the finish line. She was all smiles and waves here. A few seconds later we all crossed the finish line (again the results text message was instant - I hadn't even stopped Strava from recording when it came through). We worked our way around to the end of the finish area, collected our medals and water, and then headed into the race village and then back over to our spot near the finish line where we continued to watch the rest of the races. 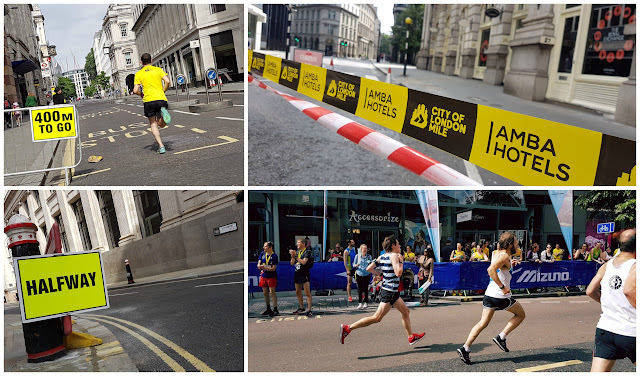 I can't help but compare this event to the Westminster Mile (blogs: 2013 / 2015 / 2016), after all they are both 1 mile events in the centre of London. For me the Westminster Mile edges it as my favourite of the two and mostly this comes down to a few things. Firstly, I prefer then setting of the Westminster Mile. Green Park is the perfect race village and the green areas make for much more pleasant surroundings; ideal for a post-race picnic. 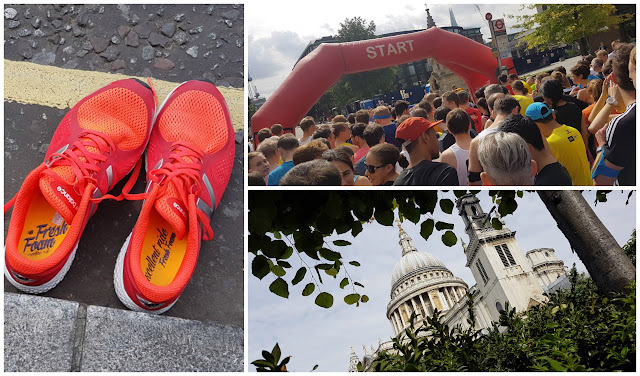 The City of London Mile did have the upper hand as far as entry fee is concerned (totally free) and of course the instant results text messaging service was amazing. My only slight gripe about the results was that the text message gave the exact finish time to the nearest 100th of a second, but the final results viewed on the official results page rounded the finish time up or down to the nearest second. With the running all done, we all headed off to find some food. Most of my friends are also vegetarian so it made sense to go and support a local vegetarian business. We headed off to Sagar which is a South Indian Vegetarian restaurant just off of Covent Garden. This was followed by some vegan ice cream in Yorica which is on Wardour Street. Exhausted but happy we headed over to Charing Cross where we caught the train back to Dartford.